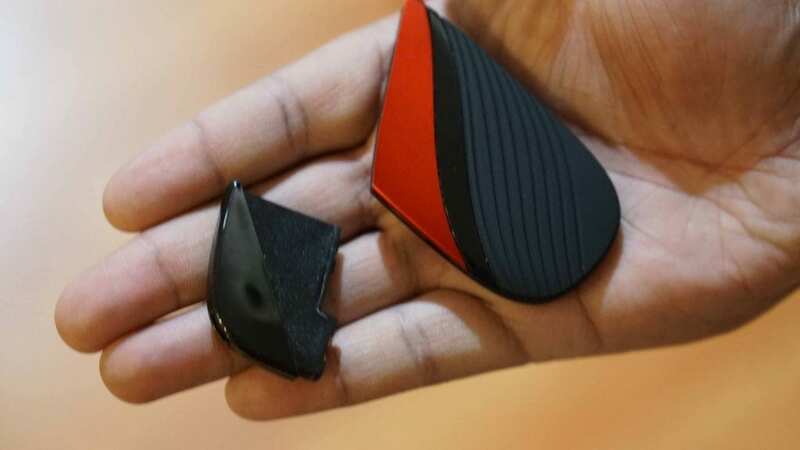 Kado Stealth Pod System Review - Daily Vaping Deals & The Best Vape Product Reviews at Vaping Cheap! In this vape review we’ll be taking a close look at the new Kado Stealth Ultra Portable System. This is one of the newer vape pod systems to be released to the market, and is packed with many different features. In addition, it’s available in a wide variety of color options, which is always a good thing! Pod Systems have become more desired than ever before in 2018, especially when considering the rising popularity of e-liquid with nicotine salts. Not to mention, these are very easy to use making them great for both the beginner and advanced vaper. Before getting any further into this review, we’d like to thank EJuice Plug for sending this product our way for the purposes of this review. We’ll cover our first impressions, usage, performance, pros and cons and conclude with whether or not we recommend the Kado Stealth Pod System! 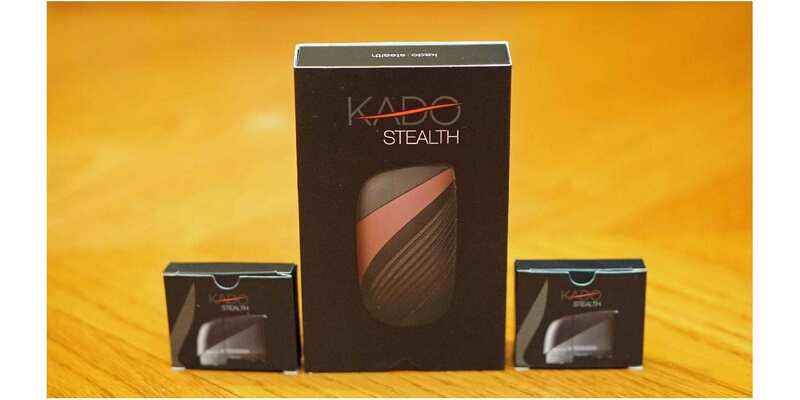 Click Here to Check Out the Kado Stealth Pod System! 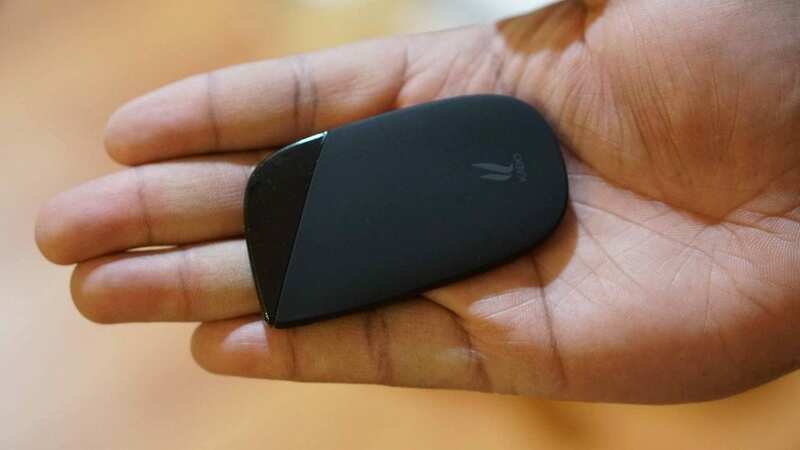 The Kado Stealth comes in a sleek looking black box that showcases an image of the actual product right on the front alongside the name of the device. On the back, you’ll see exactly what’s included and on the sides you’ll see another small image of the device and the other has the name once again. Overall, the packaging is really nice, and everything is kept secure. Once you slide out the box and lift the tab, you’re immediately met with everything that’s included with this vape kit. You do receive the Kado Stealth Ultra Portable System, one 2ml refillable pod, one micro USB cable for charging, a user manual and warranty card. The color I received was red, but there are other color options available such as green, blue, gunmetal, and champagne. Overall, I must say that the presentation of this device is top notch and definitely provided a great first impression. I will mention that this kit only including one pod is kind of a con, but for the price point, I can’t really complain too much. I do wish it came with at least two though just in case the pod included was faulty and did not work. My first impression of the pod system itself was that it’s rather sleek looking, and noticed the rubber grip right away. The entire back of the device does have that rubber grip material, but on the front you’ll also notice a shiny plastic right above it. When picking which color option you want will determine what color the accent is. The color accent surely made this pod system look that much better in my opinion. Above that is where you’ll see the pre-installed pod. Now I do want to mention that there is a sticker underneath the pod itself, so when in transit the pod system will not fire accidentally since it’s not making a connection. Most pod systems do this, but it’s something worth mentioning for sure. In addition, there’s a small sticker that’s included that says you should wait at least 10 minutes after filling to take your first vape, which is something I definitely recommend for any pod based system. I do like that they gave you these warnings right as you open the package, as a beginner might not know to wait for a few minutes after filling. Something else I recommend is taking a few primer puffs and covering the airflow hole on the pod while it’s not installed. This will help get the coil saturated with e-liquid. Something else to recommend is that you fully charge your device before the first use. All in all, my first impressions of the Kado Stealth Pod System were great! 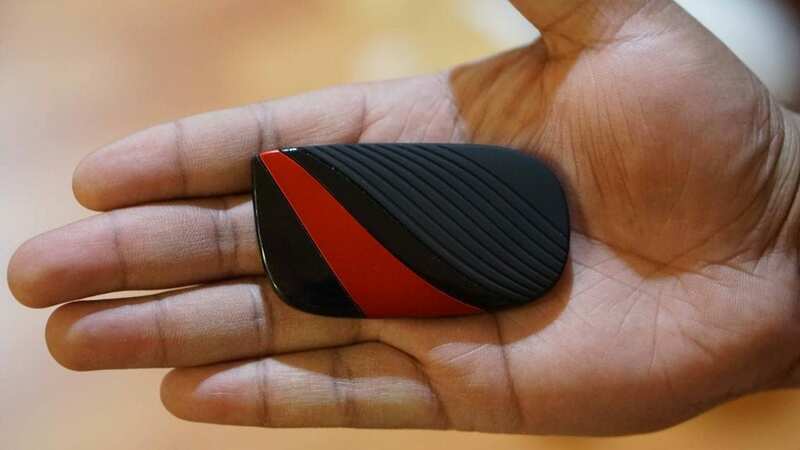 It’s a sleek looking pod system, and it’s always a good thing for companies to include some sort of warning before use, so the user doesn’t make a mistake and burn the coil inside of the pod before using it. The Kado Stealth has a rectangular shape to it, and it’s pretty compact overall, so I must agree with the “Ultra Portable System”. With that being said, it’s very easy to carry with you during the day whether in your pocket or bag. It’ll basically fit anywhere you need it to, which is always a good thing! Being that it’s a pod system, using it is pretty straightforward. As mentioned previously, you do want to fill this pod and wait about 10 minutes or so before taking your first vape. Filling it is pretty easy, but the actual fill port is located at the bottom of the pod. It’s not necessarily a con since you won’t be filling it too often, and most pods on the market are filled similarly. The fill port is a pretty decent size, and I didn’t have any issues with a dropper bottle or unicorn bottle. However, using a unicorn bottle such as the newer small chubby gorilla bottles make filling this pod much quicker and easier. The pod itself can only be inserted one way, so do keep that in mind. Installing the pod into the Kado Stealth can be done easily, and I never had an issue with it making a connection. One thing that some vapers may not like is that the mouthpiece (where you actually take a vape from) is located off to the side. It did take a bit to get used to it honestly, as many pod systems I’ve used the mouthpiece is in the middle of the pod itself. It’s not a big deal for me personally, but might not be something that caters to everyone. Holding this device is comfortable, and the grip does feel great in the hands. The front side of the grip is kind of ribbed, which does add another level of comfort. In addition, this pod system is incredibly lightweight. It is primarily constructed of zinc alloy and rubber, so it is also durable. The charging port is located on the side of the device, which is preferred in comparison to the bottom. To charge it, simply plug in the included micro USB cable while connected to a power source, and you’re good to go. It’s very simple, and I typically charge mine while the USB cable is connected to my computer. When charging it, you’ll notice the LED light, and when it’s fully charged it will remain green until it’s disconnected. When vaping, you’ll also notice the LED light turn on as you take a vape. With pod systems like this, the mouthpiece is on the pod itself; therefore you’ll have a new mouthpiece when you use change pods. This device also features a draw activated firing system (like most pods available), which is perfect for both beginners and advanced vapers. I personally prefer this type of draw system in comparison to a traditional button for pod systems, but that is subjective. I do want to mention that the draw activated firing system is a really great feature for people who are completely new to vaping, and is just making the switch. Overall, using the Kado Stealth Ultra Portable System has been a wonderful experience. I never had any leaking or connection issues during my time using it. It’s very simple to use, making it perfect for both beginner and experienced vapers alike. Like many other pod systems on the market, the Kado Stealth provides a mouth to lung vape experience. So if you’re into direct lung vaping from RDAs, RTAs, Sub Ohm Tanks and other similar atomizers, then this is probably not for you. With that being said, the draw I get from the Kado Stealth is great! It is a bit on the tighter side in my opinion, but for mouth to lung vaping, I much prefer a tighter draw than a looser draw, so it’s perfect for me. However, if you enjoy more of a looser mouth to lung draw, then you’d might be disappointed with this one. I must say though, the draw itself is quite smooth with no turbulence whatsoever. Like mentioned before though, it did take some time to get used to the mouthpiece itself since it’s off to one side. One thing I noticed while vaping this device is that right after you take a vape, you’ll still hear it firing for maybe a half of a second. Not sure why this is the case, and it could possibly be my specific unit, but it’s something worth mentioning. It never really effected my vape experience nor did it burn the coil, so it might just be the sizzle you hear from the coil itself as that’s basically what it sounds like. The Kado does have a maximum wattage output of 8w, and provides a 3.6v output. The resistance of the coil in the pods are 1.5 ohm, which is great for a mouth to lung vape. The pods do hold 2ml of e-juice, which is pretty decent. You won’t be plowing through e-liquid, so it’s a respectable amount in my opinion, especially when considering the overall size of this vape pod system. I could easily get through an entire day of vaping without needing to refill the pod, but if I was vaping quite often that day, then I may have to fill it once. In regards to how long the pods actually last, it really depends on the e-liquid. If you’re vaping on an e-juice with a lot of sweetener, then the pods won’t last very long, maybe a few days at the most. However, my pod lasted about a week before I started to notice a decrease in flavor and overall performance. Speaking about flavor, the flavor I get from the Kado Stealth is excellent! I was actually surprised by how good the flavor was, and definitely one of the best flavors I’ve experienced with any pod system. The vapor production is good, but don’t expect a ton of clouds with this one though, and this is with pretty much any pod system. The Kado Stealth does have a 450 mAh internal battery, so depending on how much you’re vaping will determine battery life. On average, I could easily get 6 hours or so of battery life with vaping pretty consistently. Charging it doesn’t take too long either since the battery isn’t a very high capacity. The battery life is pretty good overall, but if you do vape a lot, then do expect to charge it at least once during the day. All in all, the performance of the Kado Stealth Pod System was top notch! The flavor was excellent, and I could easily get through an entire work day without needing to refill or recharge the device. In conclusion, the Kado Stealth Ultra Portable System is a well built device that offers excellent performance and a compact size. Like mentioned previously, the flavor on this pod system is very good, and definitely one of the best I’ve had from any pod system that I’ve tried thus far. It’s user friendly as well, which is always a good thing! Products like this are great for those new vapers looking to make the switch to vaping and wants something that’s simply and just works. There were cons to be mentioned, and the main one is that only one pod is included. Personally, I think pod systems should include at least two pods, just in case the pod included is a dud. It’s not the biggest deal in the world, but I would’ve like to have seen an additional pod included even if the price was raised just a little bit as it’s pretty inexpensive as it is. All in all, if you’re looking for a solid performing vape pod system that’s easy to use and affordable, then I can easily recommend the Kado Stealth. This is one I will definitely continue to use.